I was surprised when I found out how many people from my gaming guild still think that the Orks are a menace. They call me cheesy and beardy for using a battlewagon spam list because they think it's too strong. Even players with a good grasp of the game mechanics believe that the greenskins are overpowered. In reality orks are an average army at best, and every decent 5th edition list should beat them, in theory. So I decided to do this post and give some insights of how to win when playing against them and the pitfalls you should avoid during your games. First of all, and I can't stress this enough, don't let them multi-charge you. Ork rely pretty much in close combat for everything. They lack any reliable long range firepower so they can pretty much only destroy your units by assaulting them. Furthermore, most successful ork builds have either large boy mobs (20+) or death-star type units (nob bikers, meganobz) so they can only assault a small number of units every turn. So, stay inside your vehicles! You are going to be safe for at least one turn. Also, keep your units spread out enough to avoid getting charged by the same ork unit. It makes a very big difference. If he is committing his expensive unit for killing one Chimera or a Rhino every turn and then getting shot by the rest of your army in your following turn he will probably lose the game. If you disembark a couple of units close together and he manages to assault both of them plus their vehicles then you are wasting valuable resources. Nob Biker plus 2 biker bosses you are almost guaranteed a win. Just kill 3 guys from one biker unit (won't be too hard with the Vendetta lascannons, veteran meltaguns and Medusas, Manticores etc.) and then hit them with Weaken Resolve. If they don't run off the table, they will be close to useless for the next turn (even if they regroup they will only move 3''). Then fire everything else on the other biker unit and you will probably kill enough. Force him to do multiple pinning checks (ordnance barrage, snipers etc.). Even if the squad make it out alive, make sure you block his way with a chimera or two. Even if he charges them and kills them you can still shoot him next turn. If everything else fails you can keep your whole army on upper levels inside ruins where the bikes can never reach your lines. Battlewagon spam is another strong orky built. Josh Roberts told me about it a while back and I've been using a variation of this list since then. He seems to be doing very well in tournaments so probably a lot of people don't know how to play against this type of army. Again for a Guard player this should be a piece of cake. Since your opponent will want all of his Battlewagons to benefit from the Kustom Force Field he will have them close together in the beginning of the game. If you are playing first then shove your veterans inside your Valkyries/Vendettas and charge his vehicles. I am using Demolitions on mine but even with krak grenades, 10-20 S6 auto-hits against AV10 (rear armour) open topped vehicles are enough to cripple them. The magic here is that you can multi-charge the Battlewagon. So even with 10 Veterans you will be doing 2-3 hits on every vehicles. If the guys are holding meltaguns even better. Leave them standing in front of the vehicles during the assault so even if the Battlewagons survive they will have to go through (tank shock) their meltaguns (death or glory) in order to move next turn. 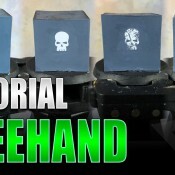 If you don't have anything like that to throw on the first turn then make sure you prioritise your shooting very well. Focus your fire on the Battlewagon that the Big Mek is going to be riding. Manticores are ideal for this. Railguns, lances, meltas are all good for this job too. I wouldn't waste my lascannon shots though. Make sure you take it out and then shoot the unit with the Big Mek inside. If you force them to fall back or get pinned then you have much better chances of destroying the other Battlewagons in the following turns. Another short tip. Keep your vehicles 13'' from his Deffrollas. They really hurt! 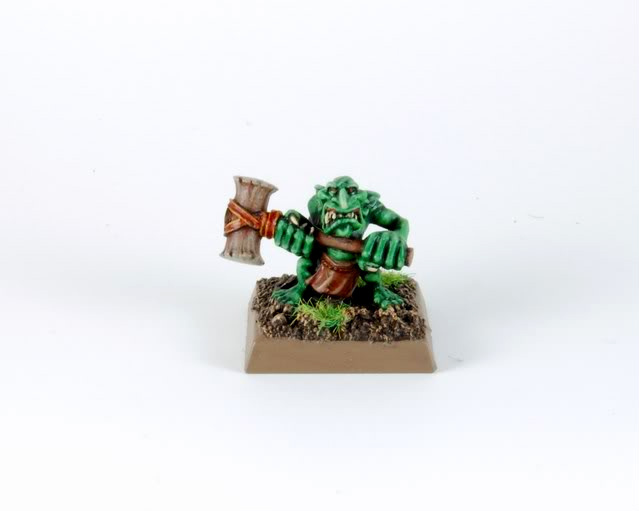 Horde ork armies although not very competitive, sometimes can be a pain to deal with properly. Obviously they are really slow, so you will have enough turns to shoot them to pieces and counter charge them. Take extra care on Dawn of War deployment to have some of your units in the front so they can push his large mobs back. If he deploys 2 x 30 strong Orks 24'' across from your battle-lines you could be in trouble (as I found out recently). Blasts and flamer templates are ideal for taking large quantities of ork out of the game. A clever opponent will spread out his units as much as possible to avoid this. One counter measure is to tank shock his unit and land of top of his models so he will have to squeeze them together and produce a tastier target for your flamers. So keeping these tips in mind it shouldn't be difficult to counter anything that a "cheesy" ork player could throw at you. Stay focused on target priority, keep your units spread out so he doesn't multicharge you and you will be absolutely fine. Absolutely spot on. I think it's very easy to give an Ork opponent too much respect because facing down hundreds of boys can be very intimidating. I experienced this first hand against a 3 Battle Wagon list earlier this year. The Wagons contained 2x 20 man boyz units and a unit of Mega Nobz with Ghaz. I'd never fought Orks before and I was overwhelemed by the green-tide before me I froze up and made a lot of bad decisions. Now I'm a little wiser (thanks in no small part to owning my own green tide) I realise that I had the units in my list at the time to comfortably handle that list. Ghaz and Mega Nobs are always going to be tricky but they're not impossible to deal with though. If I had my time again I would have sacrificed my Sternguard early to roadblock a Battle Wagon or two and try to take at least Ghaz's waggon out to force them to walk. 20 strong Boyz units are not really as deadly as you'd expect them to be, particularly if you can deny them the charge. Also if you have a 3+ save on your side (as I did) you are pretty likely to win a cc battle of attrition against them. In short, know your enemy! Yep, take away their ride and they have nothing to compensate for it. No mobility, no shooting, nothing. Sacrificing a couple of small units or using a couple of transport as road block I think is really worth it in the bigger picture of the game. Having played with ork for a few years now I am well aware of their weaknesses and limitation and I just think people shouldn't be intimidated by them anymore.